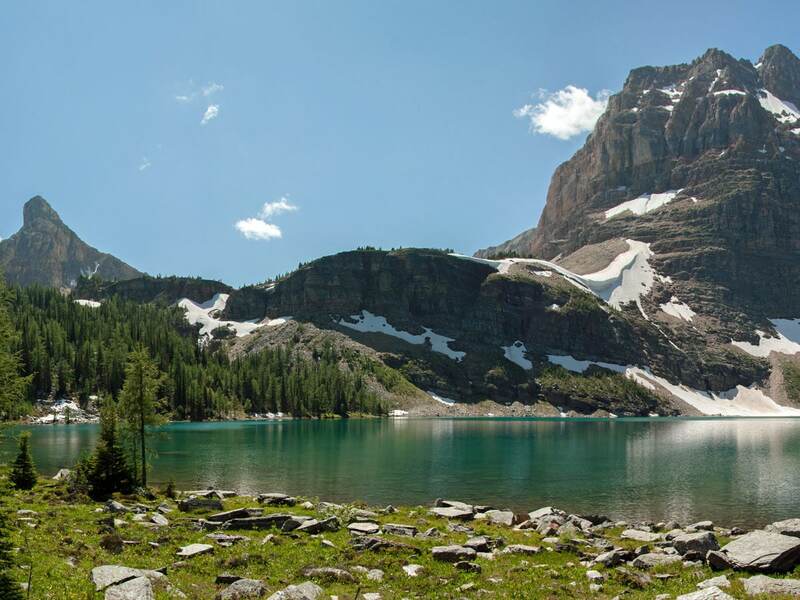 A backpacking trip through Gibbon Pass, Whistling Pass, and Healy Pass traverses three flower-filled alpine passes, multiple lakes and tarns, an old growth larch forest, and takes you along a trail surrounded by glacier studded jagged peaks. 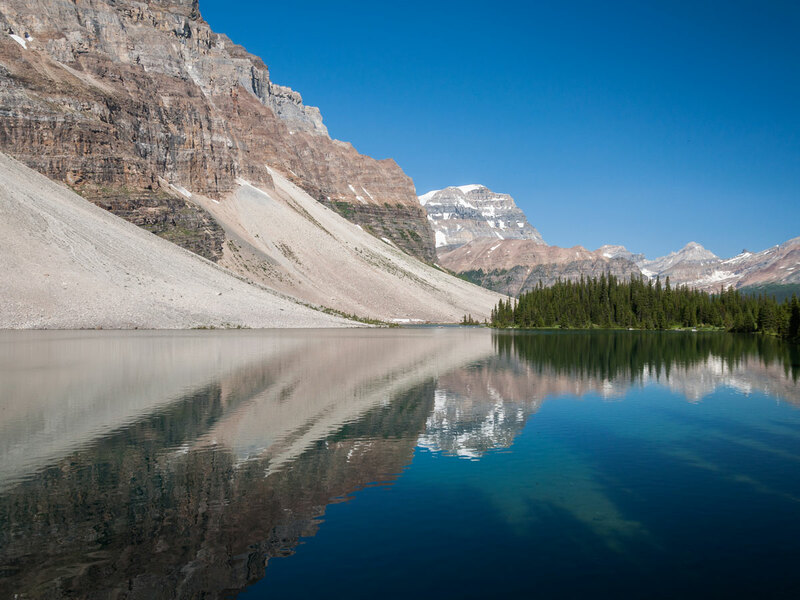 This is a spectacular trip, showcasing all the magnificent beauty the Canadian Rockies have to offer. The Vista Lake trailhead is on Highway 93 S, 8.0km south west of Castle Junction. The trailhead is found on the east side of the road. 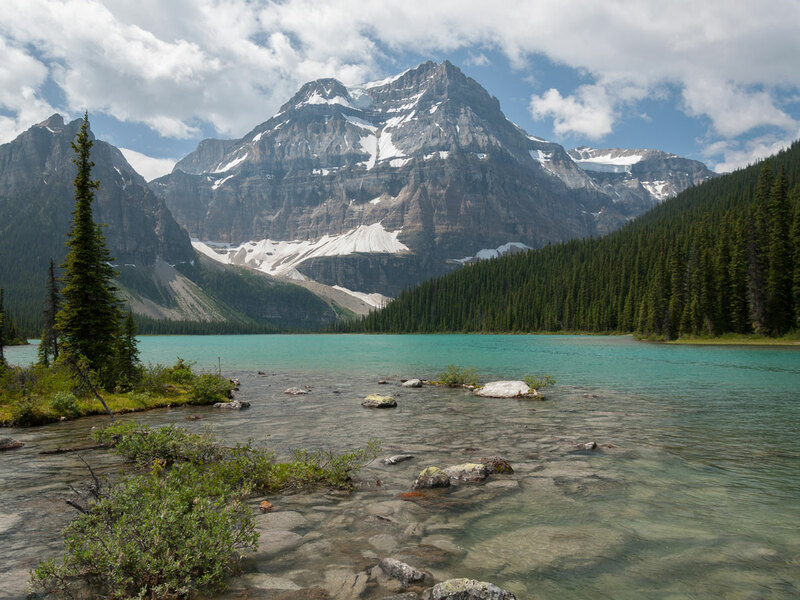 This is a reasonably scenic backpacking trip with a little of everything – big mountains, lakes, wildflowers, and glaciers. 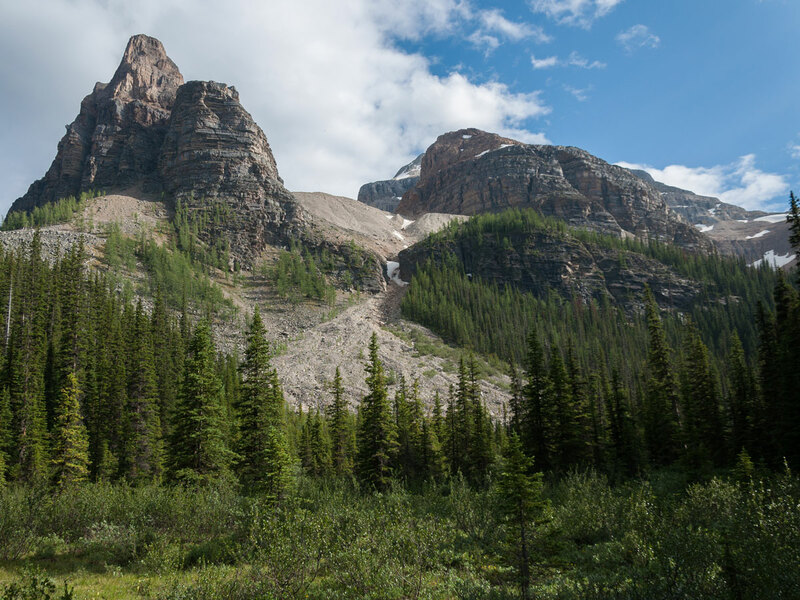 We did it in a leisurely four days, camping at small campgrounds at Upper Twin Lake (TW7), Ball Pass Junction (RE21), and the large campground at Egypt Lake (E13). If there has been a lot of rain beforehand, expect the trail conditions to be muddy, rocky, and rooty. You may end up spending a fair amount of time watching our step instead of the scenery. Wet springs and summers also mean that mosquitoes can be out in large numbers, so be certain to bring some sort of protection from them. Two cars are required for this trip (or some taxis are needed) as this is a one-way trip from the Vista Lake trailhead off highway 93S to the Sunshine Meadows parking lot. 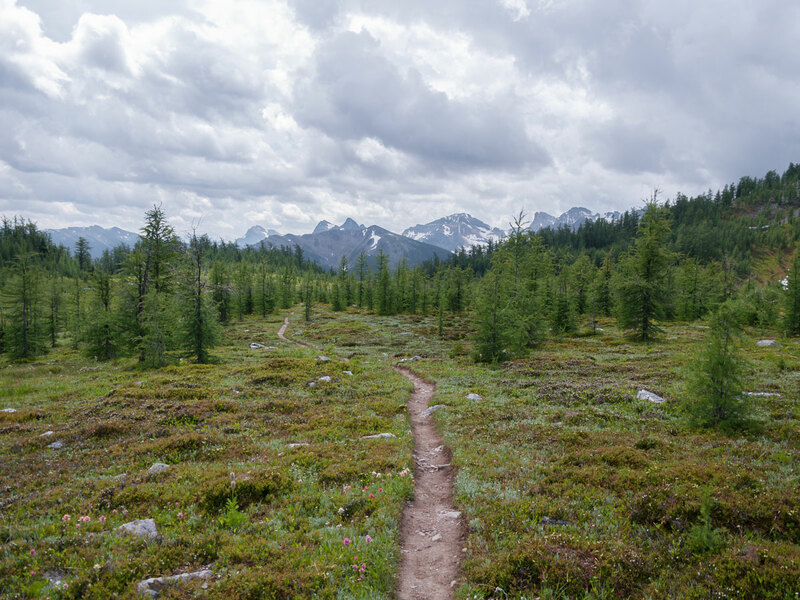 We recommend doing the hike from North to South as it will mean the steepest sections will be done as descents rather than ascents and the final day – hiking out along Healy Creek – will be very easy. This backpack could also be combined with the backpack from Sunshine to Assiniboine for an epic trip!  Drop a car off at the base of Sunshine Ski hill and take another to the Vista Lake Trailhead on the 93S (or just take a taxi if that’s easier). Today’s hike is probably the least scenic of the trip, but still better than a day in the office. 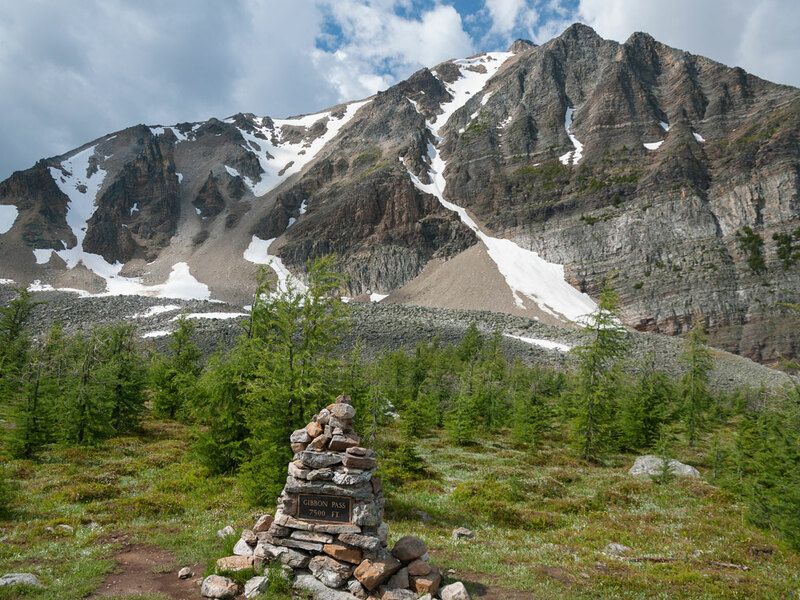 The trail is only 7.2km in to Twin Lakes campground, so you could start this route after work if you’re pressed for time. The long Canadian nights mean you usually have sunlight until 10pm. The backpack begins with a steep descent to Vista Lake. This descent is a grind, considering you’ll have to climb back up later. 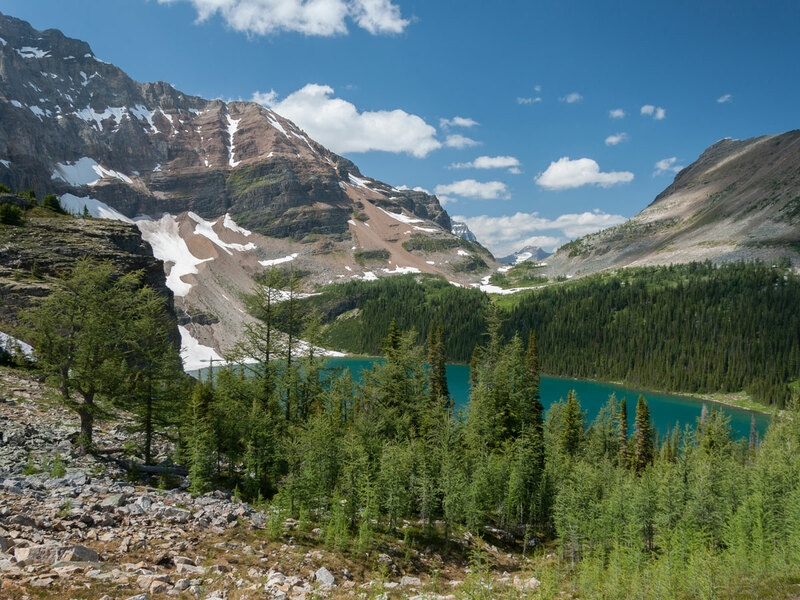 Once you pass Vista Lake, you’ll climb the longest ascent of the hike (585m) through a decades-old regenerating burn to Arnica Lake. 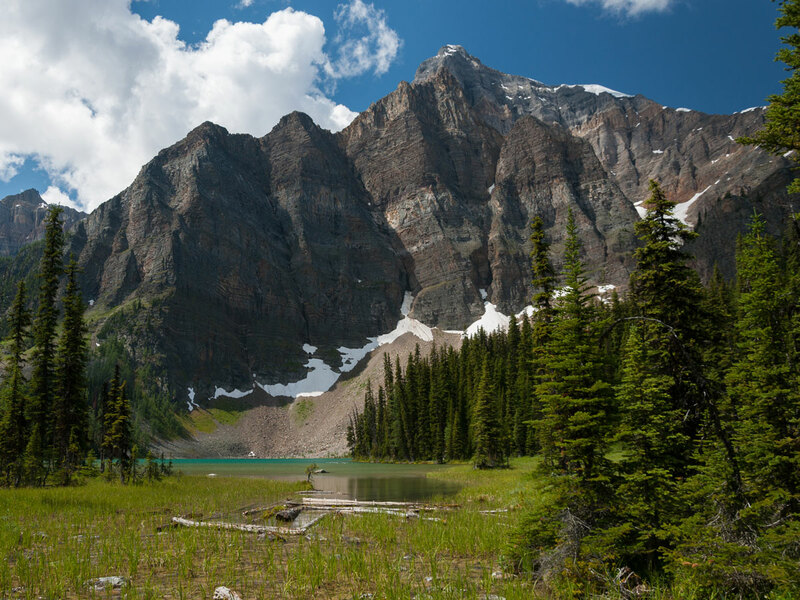 Upper Twin Lake and campground (TW7 – 5 pads) is lying over the hill to the south of Arnica Lake and it is a 130m ascent. 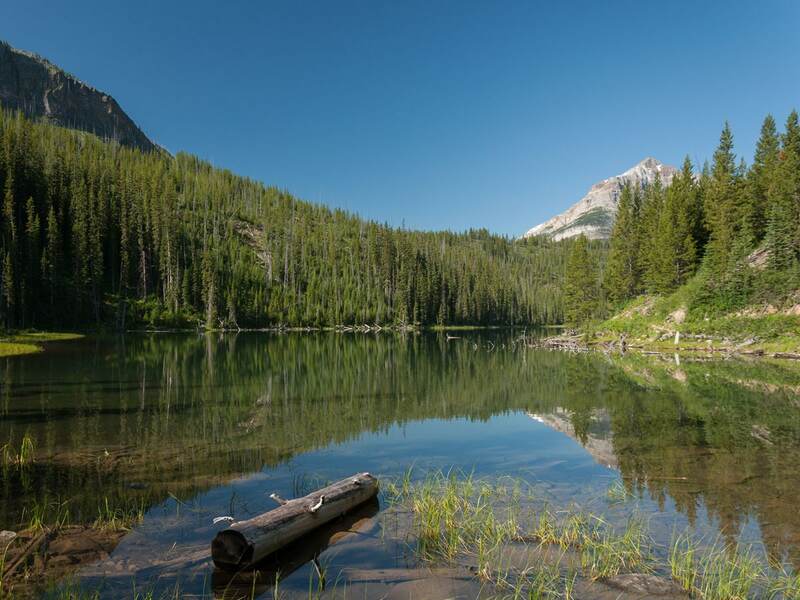 You can also access Twin Lakes campground with a longer route from Twin Lakes trailhead. 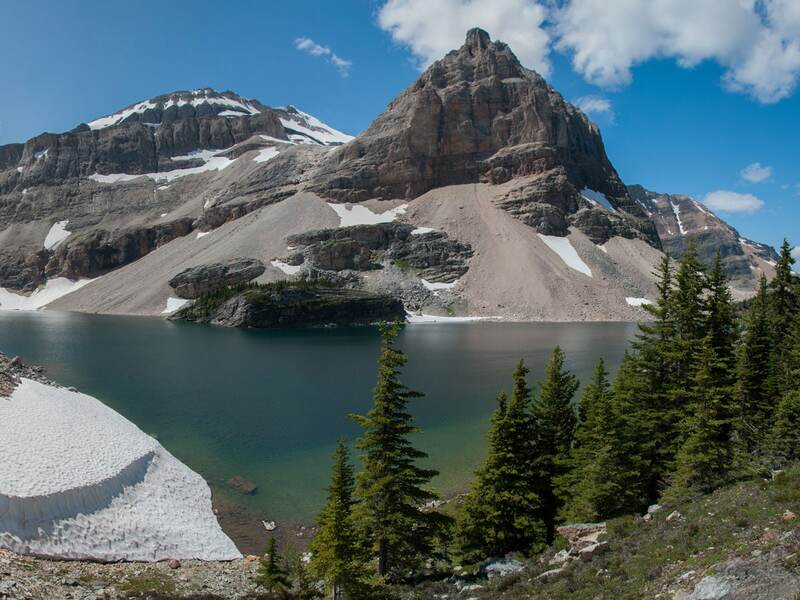 From Upper Twin Lake descend to Lower Twin Lake, then gently ascend to Gibbon Pass. Gibbon Pass is wonderful and is the first time you’ve been out of the trees for a significant length of time since the beginning the trip. 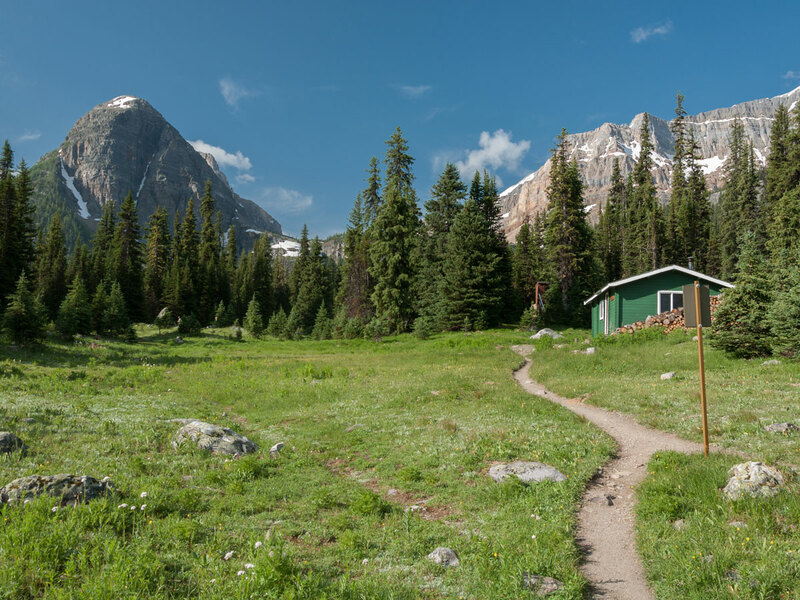 The trail then descends steeply from Gibbon Pass to Shadow Lake Lodge, a lovely grouping of log cabins in a very pretty part of Banff National Park. This is a great place to stay, providing a luxury experience. 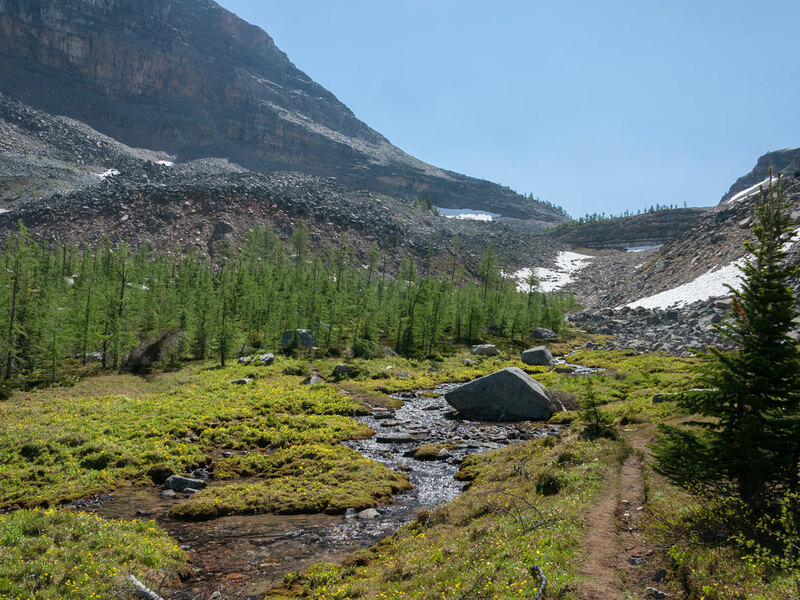 Continue past Shadow Lake Lodge and follow the path as it then meanders to Shadow Lake. There is a nice bench at the outlet stream and a bridge, both of which are great places to relax and enjoy the stunning view. On a nice day you can end up spending an hour or two here without even realizing it. From Shadow Lake the trail to Ball Pass camp is generally flat. Energy permitting, a quick day hike up Ball Pass is worthwhile. It’s 2.7km one-way with 370m of elevation gain. Ball Pass Campground (RE21) has 5 campsites and is a pleasant campground. Departing Ball Pass camp, the trail initially ascends very steeply before becoming fairly level. Pass a mosquito-breeding pond, then reach beautiful Haiduk Lake. 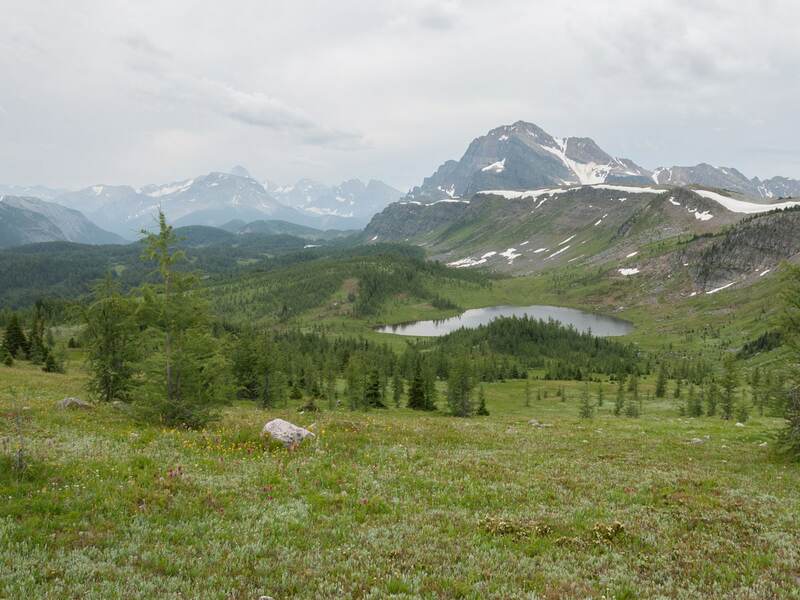 From Haiduk Lake ascend to Whistling Pass, watching for marmots along the way. The initially steep ascent from the lake quickly becomes more bearable. 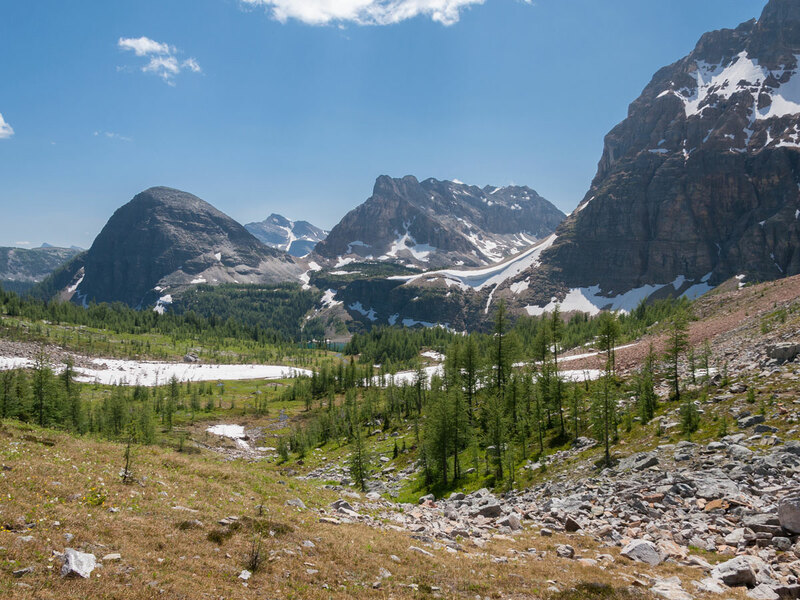 The views from Whistling Pass are one of the highlights of this trip and the descent towards Egypt Lake will take you through flower and marmot-filled meadows. About halfway to Egypt Lake camp from the pass, reach a signed junction for Scarab and Mummy Lakes. While this detour is only about 3.0km with 300m of elevation gain you will be doing it with a full pack, but it is definitely worth it if you have the energy. Re-ascending to this point from Egypt Lake camp with a light pack is less attractive as this would involve a very steep ascent. 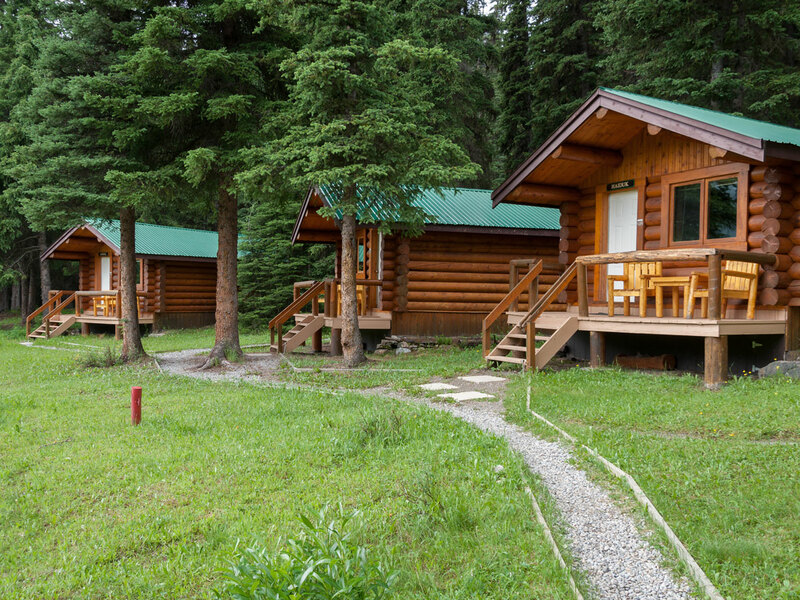 Egypt Lake camp is the largest campsite in the area and includes a minimally-equipped cabin that can be reserved in advance through Parks Canada if you’re tired of tenting by this point. You’ll have a dozen others cramped in next to you, however, so probably preferable to get the tent set-up. There are many other lakes in the vicinity of the campground and all would make nice evening hike destinations, but we choose to relax by the stream instead. 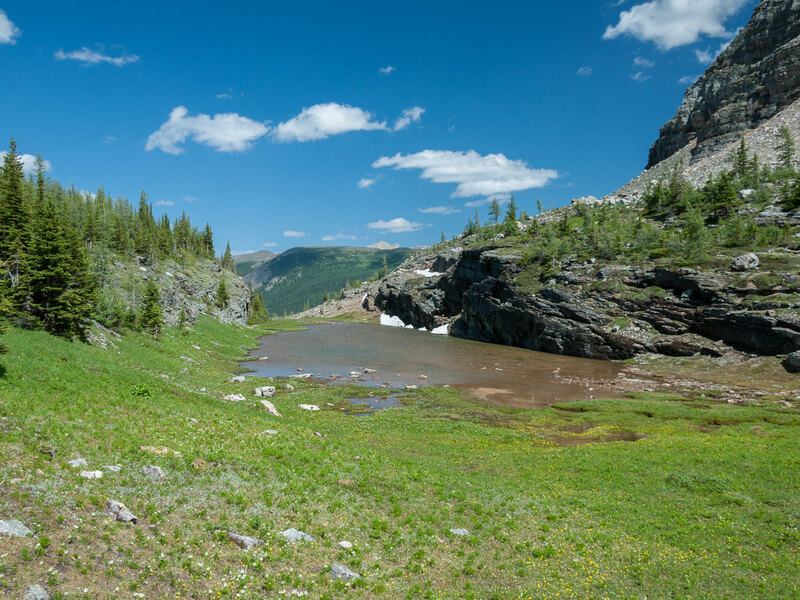 Departing Egypt Lake involves the second longest continuous ascent of the trek – 340m – but the views and meadows of Healy Pass more than make up for it. 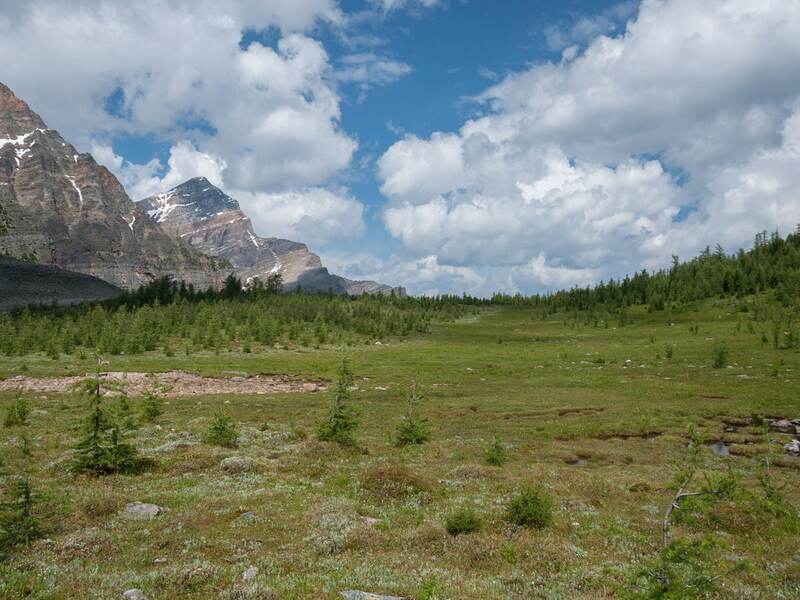 The trail from the meadows to the Sunshine parking lot is the best section of trail on the entire hike, and with the exception of the first few kilometers, is gently graded thus allowing for a speedy exit. 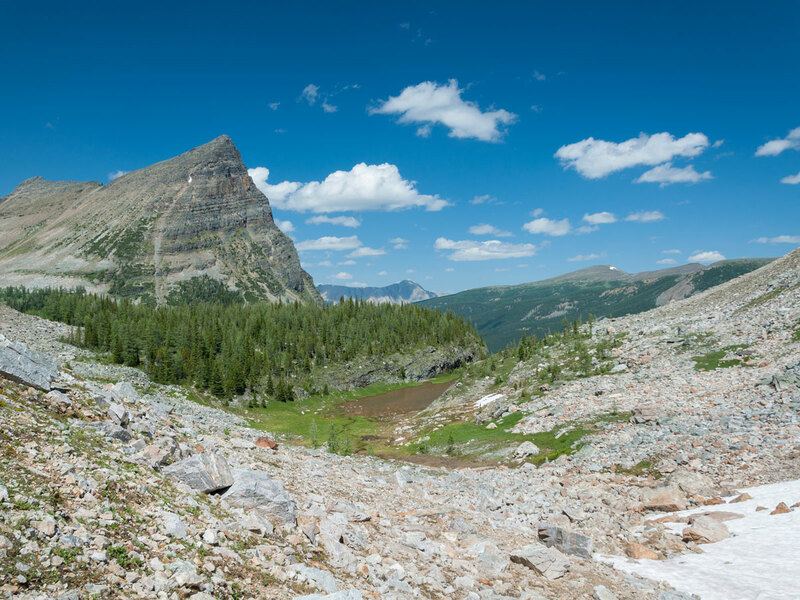 The path is clear, with the only choice whether you take the variant down Simpson Pass. These are popular camping sites so be sure to book your sites well in advance! This is a one-way trip so will require you to pre-park a car at the end or use taxis. We prefer to use taxis. 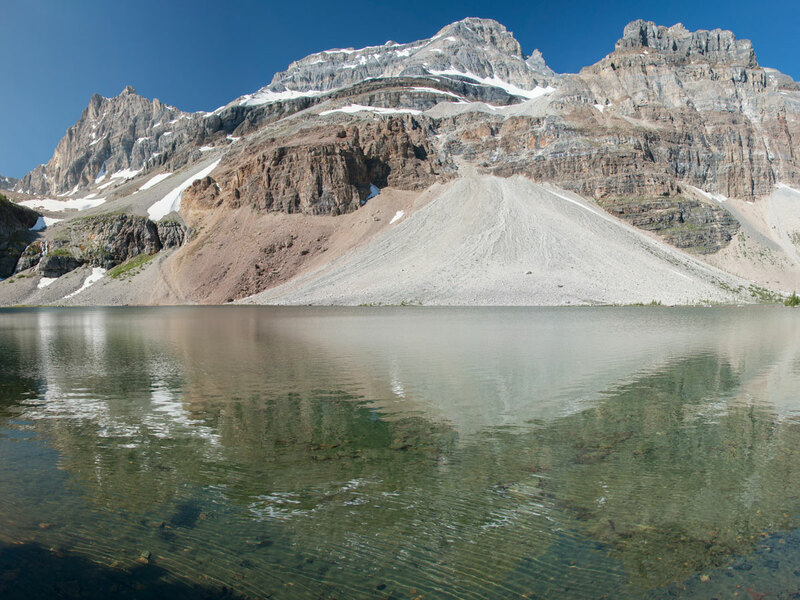 Combine this trip with the hike from Sunshine to Assiniboine for an exceptional trip. If you hike over Ball Pass you hike down to the 93S, which connects with the spectacular Rockwall Trail. We haven’t done that connection, but it’s on our list as an epic backpacking trip.